and the blade would spring out, slim and straight, with the convent chill that a weapon has. inside a drawer, in amongst your knickers and amongst your stockings. I look at it again, lying open in my palm, just as dangerous as when I was a child. Sensual, cold. Nearer my neck. First Love (Primer Amor) first appeared in English in the 2006 Bloodaxe edition of Joan Margarit’s poems, Tugs in the Fog: Selected Poems, translated from Catalan by Anna Crowe. It was originally published in Els Motius del llop (The Motives of the Wolf) in 1993. A subsequent collection of Margarit’s translated work, Strangely Happy, appeared in 2011. Joan Margarit was born in Catalonia in 1938, towards the end of the Spanish civil war. The fascist dictatorship banned his native language, and all education took place in Castilian. “I had no culture in any other language,” he writes in the prologue to Tugs in the Fog. “Years later, I moved over to writing in Catalan, searching for that which goes deeper in all of us than literary culture … I gain access to the poem in Catalan, but I immediately begin to handle the Castilian version as well … I make all the modifications in both Catalan and Castilian at one and the same time.” All Margarit’s books have been published in both Catalan and Castilian, and First Love can be read in its original versions. In the English translation, the Germanic phonemes, often abrupt and harsh compared to those of the more mellifluous Romance languages, work in the poem’s favour: “postwar”, “knife-shop”, “clasp-knife”. 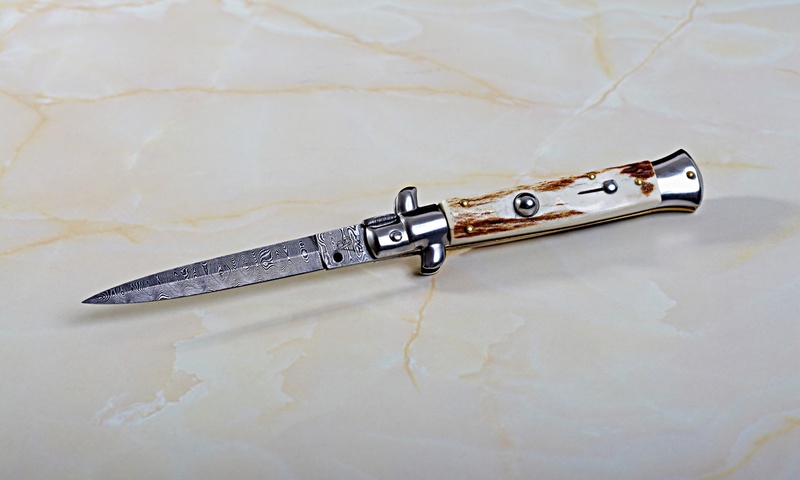 Although the knife is the one beautiful, glittering object in a “dreary Girona” identified with the protagonist’s very self, and becomes the boy’s first, and instantaneous, love, this narrative is no sweet nostalgia trip. Crowe refers, in her translator’s note, to an effort to “remain faithful to what he” (the poet) “called ‘an almost excessive brutality.’” This brutality is often simply the pitiless emotional directness of Margarit’s poems. Here, the most piercing thrust is reserved until the end, but there is considerable tension throughout – an ebb and flow of menace sustained as memory cuts effortlessly through the swathe of years. At the start, the protagonist is seven years old, considered in Catholic teaching to be the age of reason, the point at which the child has acquired sufficient knowledge and judgment to be ready for confirmation. The child in the poem enters time with the secret purchase of the knife, aware that his purchase infringes family rules. The weapon, a guilty pleasure, is a weight in the pocket with a near magical life of its own: “From time to time I would open it slowly / and the blade would spring out, slim and straight.” It is replete with symbolic potential, but also vividly real, and the narrative potency of the knife is ever-present, like that of Chekhov’s proverbial gun. “If in the first act you have hung a pistol on the wall, then in the following one it should be fired. Otherwise don’t put it there” (Gurlyand’s Reminiscences of AP Chekhov). Conventional adjectives – “long”, “slender”, “slim”, “straight” – evoke the phallic (and also feminine) beauty that will later degenerate to become “sensual, cold”. The earlier descriptions, while effective, hardly prepare us for the shock of the adjective-noun juxtaposition in line 14, where the knife is felt to possess “the convent chill that a weapon has / Hushed presence of danger …” Catholicism may be merged here with political dictatorship. Smuggled safely into adulthood, the clasp-knife is anaesthetised, almost literally, by the poet’s vocation. Later, its phallic potential is both evoked and suppressed when it appears, in obscene intimacy with the underwear of the woman whom the poem turns out, surprisingly, to address. Again, the translator’s ear is acute: a rustling, nestling contact is suggested by the repetition of “amongst”. So the secret becomes domesticated, tenderly shared with a wife or partner, and nothing terrible has occurred after all. But if we imagine the weapon to have been tamed, we’re in for a shock. In the last line the blade seems to spring out again, this time with truly lethal intent, the inescapable violation that time inflicts on everybody: death. “In spite of everything the past ends up being / a brotherhood of wolves, melancholy / for a landscape skewed by time,” Margarit observes in another poem, Self Portrait. His work is time-haunted and death-haunted, but the poems also have a wonderful, clear, intelligent light in them. Margarit is perhaps firstly a love poet, and, readers can be assured, his loves are more often flesh and blood than steel.